The main objective of the project concerns comprehensive curriculum development in the field of EU Business Law at the Deák Ferenc Faculty of Law of Széchenyi István University. The project aims at elaborating the scope and content of complex course structure, establishing the methodology of the courses, composing of 2 elective courses announced in English. The new courses will be announced for students attending MA law, for incoming Erasmus-students of the Faculty and also interested students in international administration and economics will have the opportunity to participate. The team members will elaborate up-to-date course materials, including systematised course presentations and a concise course book in English in order to foster the publication and dissemination of the results of academic research conducted within the three years long project. The main aim of the project is to deliver tailor-made courses for the participants and for that reason, the teaching methodology will also apply innovative approaches. 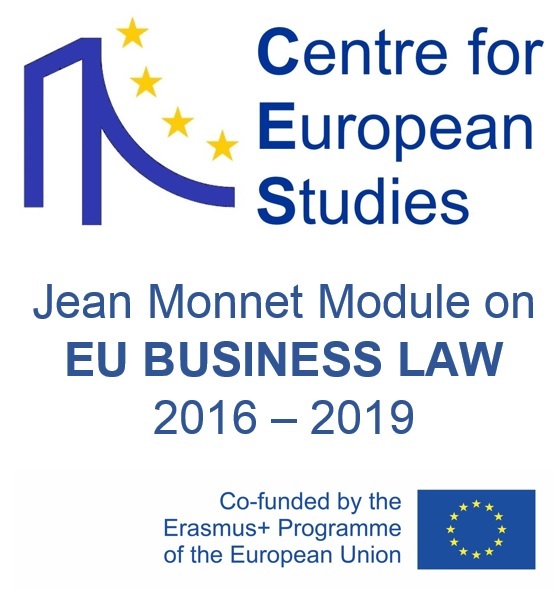 The Jean Monnet Module will be predominantly based on the ‘law in context’ approach and will offer a perspective behind the text of law in order to equip students with the ability to understand the real function of the legal instruments governing the business relations within the EU internal market. In this way, the project is expected to improve teaching capacities in the field of EU Business law in English at the Faculty, as well as to provide quality course materials. The Jean Monnet Module will be carried out within the infrastructure of the Centre for European Studies, therefore the project might give also new impetus to this research institution of the Faculty established within a former PHARE project in 1998. Moreover, as an expected post-grant impact, the project outcome might contribute to the accreditation of a post-graduate course (LL.M.) for legal professionals as well.